I do enjoy serving duck occasionally and I couldn’t wait to try the recipe for this tart, yet sweet sauce which really compliments the meat. Every autumn, I am found picking blackberries for the freezer and this year there was an abundance of them everywhere although most of mine come from a friend’s field on the Isle of Wight. Melt half the butter in a pan; add the shallots and garlic and gently sauté for 5-6 minutes, or until softened. Add the star anise, five spice paste, ginger, honey, wine, stock and blackberries. Simmer for 12 to 15 minutes. The aroma is really tantalizing. The original recipe suggests adding half the blackberries here and then adding the remaining half with the cornflour mixture but as I have an aversion to lumps in my sauce, I preferred to add all mine in one go and push them through a sieve for a smooth sauce. Meanwhile, score the skin of the duck breasts in a criss-cross pattern and season well. Heat a dry ovenproof frying pan and fry the duck skin-side down over a moderate heat for 3 to 4 minutes. Turn the breasts over and cook in the preheated oven for 8 to 10 minutes or until they are cooked to your liking. Continue cooking them on the hob if preferred. Push the sauce through a sieve into a clean pan, season and simmer for 4 to 5 minutes. Add the rest of the butter and cornflour mixture and cook over a medium heat for 3 to 4 minutes or until slightly thickened. Remove the duck from the oven; cover and set aside to rest for at least 5 minutes. Slice the duck and serve with the sauce. Delicious served with saute’d pak choi and mashed sweet potato. The recipe makes sufficient sauce for at least four servings. Tip: the sauce can be made in advance and reheated until piping hot. 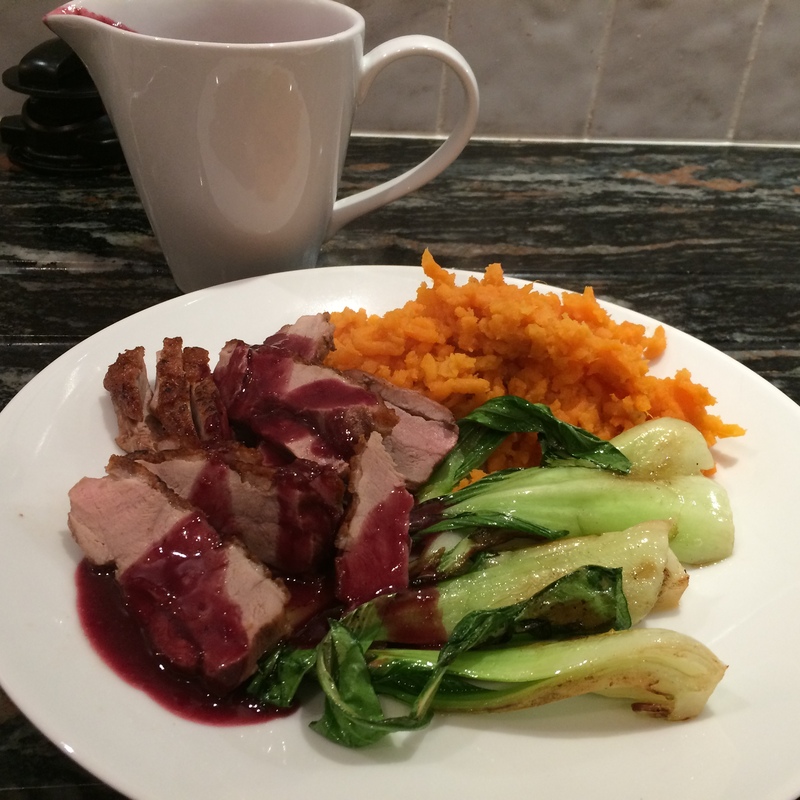 This entry was posted in Dinner and tagged Blackberries, Dinner, Duck, Gluten Free, Pak Choi, Sweet Potato, Wheat-Free. Bookmark the permalink.